Gentlemen, a few days ago, my YouTube channel surpassed 50,000 subscribers! This happened pretty fast and I appreciate each and every one of you that have subscribed, commented and liked my videos. Your subscription and your engagement helps my channel grow so more guys see the content that I’m sharing and working hard to produce. In order to show my appreciation even more, I’m running a big giveaway! I’ve teamed up with Tiege Hanley Skin Care, Anson Belt & Buckle as well as a few things I’ve thrown in myself to make this giveaway happen. First of all, Tiege Hanley is giving away a free 6-month subscription of their Level 3 skin care system which is close to a $300 value. 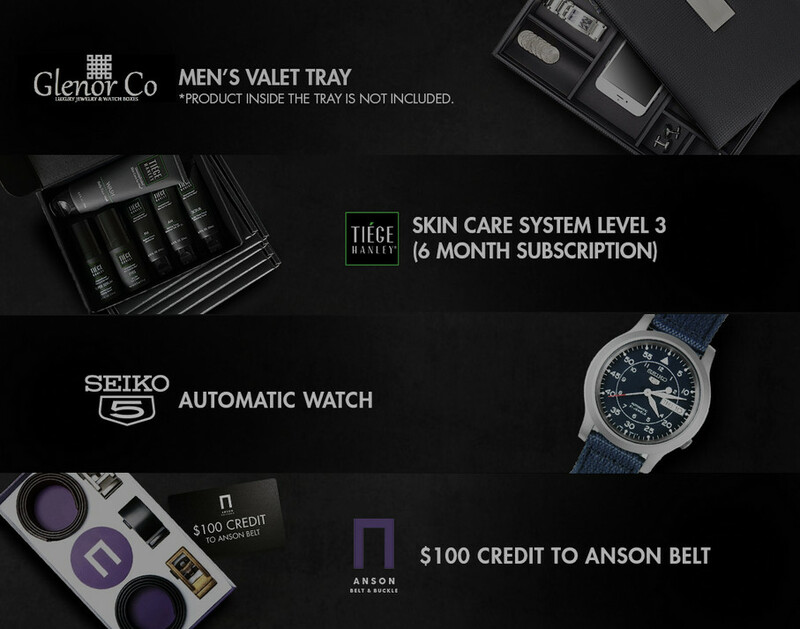 Next, Anson Belt is giving away a $100 gift box which allows you to pick whatever combination of belt straps and buckles you choose for the box. Lastly, I went into my own pocket and bought a few items to help sweeten the giveaway just a little. We have a Glenor Co dresser-top valet tray to hold all your loose items in a stylish tray, and we have a Seiko 5 Automatic watch with a see-through case back. Take a look at the video to see these better. Thank you again for subscribing and…. GOOD LUCK!! Subscribe to the 40overfashion YouTube Channel & Like this video to be Eligible. I’m always following… very inspiration videos..
Firstly, Rings; how many, which finger to use,I.e. military rings Army ,Navy, Air Force and USMC, in my case being Canadian my Airborne ring. Secondly does fashion change much for guys in the mind 50s? Once I did have a woman say that was well put together with clothing, and she asked if I cared about my dress and initially I said no, however I ensure that look good standing next to my wife😉. Hi Dan! Thanks for your comment! Personally, I’m not too into rings as accessories, but I know a lot of guys are. I’d say if you’re already wearing a wedding band on one hand, the Airborne ring on the other is fine. Two on the same hand might be a little much. Style is pretty subjective, but I’d say that style in your 50’s is a lot like it is in your 40’s (I turn 50 next week). I like to keep my overall style casual clean & polished without being too serious. I think nailing the fit of your pieces is critical, because baggy pants and a billowy shirt doesn’t really look good on anybody. The one thing I keep running into, is there aren’t many places to shop that are geared specifically towards the older man besides suiting stores or Tommy Bahama. We don’t have as many options as younger people do. One thing we can do to keep a clean look is to look at smaller patterns. Instead of choosing a big, bold or blocky pattern shirt, maybe try a smaller, tighter pattern. Hope this helps and I’m glad you’re here!